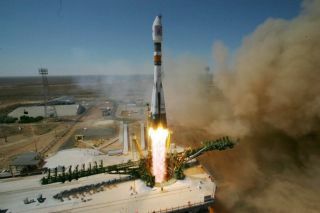 A Russian Soyuz-FG rocket launches 5 satellites from Baikonur launch site on July 22, 2012, at 10:00 Moscow time. Kazakhstan may want jurisdiction over Russia's main rocket-launching site, which lies within the Central Asian nation's borders, according to media reports. The two countries are discussing returning control of the Kazakh city of Baikonur to Kazakhstan, Russia's Ria Novosti news agency reported today (Dec. 10). Russia has launched manned and unmanned missions from Baikonur Cosmodrome for decades; since the breakup of the Soviet Union in the 1990s, this has been done under a lease from Kazakhstan. "Today both nations' governments have decided to set up a new intergovernmental commission for the Baikonur complex to be headed up by first or other deputy prime ministers," Kazakh space agency head Talgat Musabayev told Kazakhstan's parliament today, according to Ria Novosti. Kazakh officials demanded that the commission be established, Ria Novosti reported. Russia currently pays Kazakhstan $115 million annually to use Baikonur Cosmodrome, plus $50 million every year for maintenance, under a deal signed in 2004. That agreement is slated to expire in 2050. At the moment, Russia is the only nation capable of launching astronauts to the International Space Station. Russia's crew-carrying Soyuz spacecraft all launch from Baikonur, with the next manned flight to the orbiting lab slated for Dec. 19. That liftoff will carry NASA astronaut Tom Marshburn, Russian cosmonaut Roman Romanenko and Candian Chris Hadfield into orbit, bringing the station's current Expedition 34 mission up to its full complement of six crewmemembers. Russia plans to withdraw from Baikonur eventually, Ria Novosti reported. The nation will shift Baikonur's launches over to Plesetsk Cosmodrome — an operating spaceport about 500 miles (800 kilometers) north of Moscow — and the unfinished Vostochny space center in the Russian Far East. Russia and Kazakhstan are also working together on a new complex at Baikonur. The facility, called Baiterek, will support launches of Russia's Angara cargo rocket, which is currently in development.